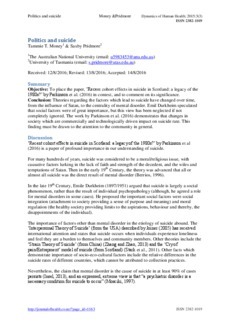 Objective: To place the paper, ‘Recent cohort effects in suicide in Scotland: a legacy of the 1980s?’ by Parkinson et al. (2016) in context, and to comment on its significance. Conclusion: Theories regarding the factors which lead to suicide have changed over time, from the influence of Satan, to the centrality of mental disorder. Emil Durkheim speculated that social factors were of great importance, but this view has been neglected if not completely ignored. The work by Parkinson et al. (2016) demonstrates that changes in society which are commercially and technologically driven impact on suicide rate. This finding must be drawn to the attention to the community in general.